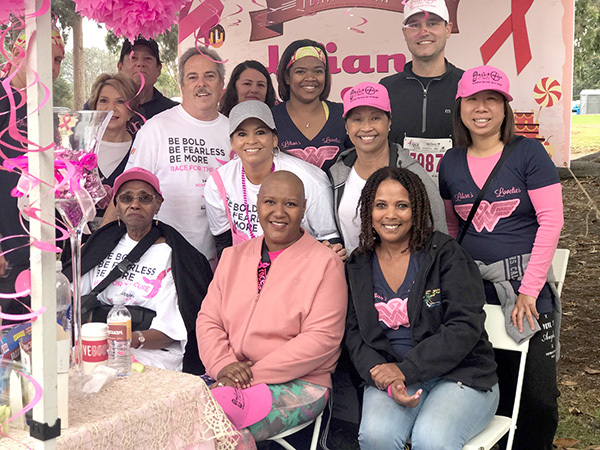 While Komen’s financial assistance programs were not a top priority for Vanvieldt-Gray , the biggest benefit from the organization came in the form of an introduction to Race for the Cure and its community of survivors. Vanvieldt-Gray underwent a double mastectomy, radiation, and chemotherapy with two drugs that were discovered through Komen-funded research. She said that she credits them with helping save her life and also discovered during the process that she has the BRCA2 gene, which predisposes her to developing breast cancer. She discovered the gene was passed to her through her father who also had prostate cancer, along with her grandfather and every one of her uncles with the exception of one. “Finding out that there is a link between that gene and what I had, if I had known that before, I probably would have had the mastectomy done before,” she said. 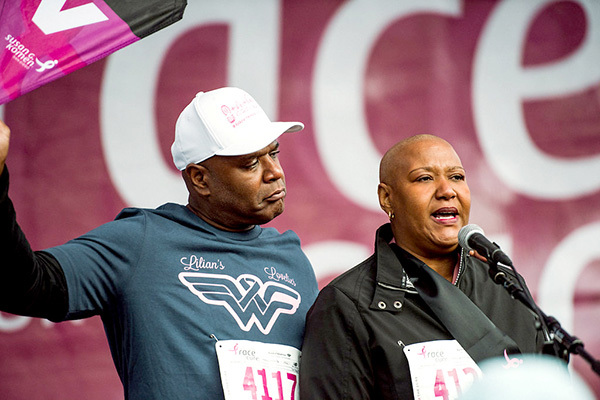 Through the process and working with Komen, Vanvieldt-Gray realized that access to health care, testing and treatment that she had is not readily available to everyone. Dr. Siavash Jabbari, MD, radiation oncology director at Laurel Amtower Cancer Institute and Neuro-Oncology Center in Linda Vista, was Vanvieldt-Gray’s radiation doctor. Dr. Jabbari explained that there are a lot of people who live in lower-income communities who tend to be so disenfranchised with the health care system, that they don’t know where to look or what treatment options are even available to them. Jabbari said that with the mortality rate in African-American women, a small part of it is biological, as certain types of cancers can be more aggressive for them. Shaina Gross, Susan G. Komen San Diego president/CEO, said that 1 in 8 women will be diagnosed with breast cancer in their lifetime. In the African-American community, it is 1 in 9, so the incidence rate is actually less, but the mortality rate is 40% higher. Gross said that this is one of the things that Komen does for families. It also has other programs, including financial assistance, which help cancer patients and their families through many things — gas cards, food pantry access, grocery cards, even things like paying car registration so that patients can continue to drive to appointments. Jabbari said the financial assistance gap filler is important for patients and families that don’t have that kind of support system. 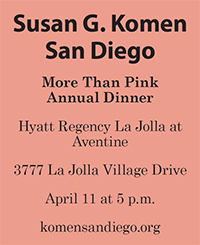 The annual More Than Pink Dinner is coming up on April 11 at the Hyatt Regency La Jolla Aventine. A fundraiser to provide services year round, Gross said that along with its Race for the Cure, it is a great opportunity to spread the word about Komen’s services. “The next time someone says, ‘I just don’t know how I’m going to get through this,’ we will have 350 people in the room that can say, ‘Call Komen,’ and that we have the resources to be able to support them,” Gross said. Locally, of the money Komen raises, 75% of that money stays in local programs, the financial assistance program, paying for MRIs, ultrasounds, and more. Twenty-five percent of the money goes to its national headquarters and that pool of money from all of its affiliates is invested into international research. 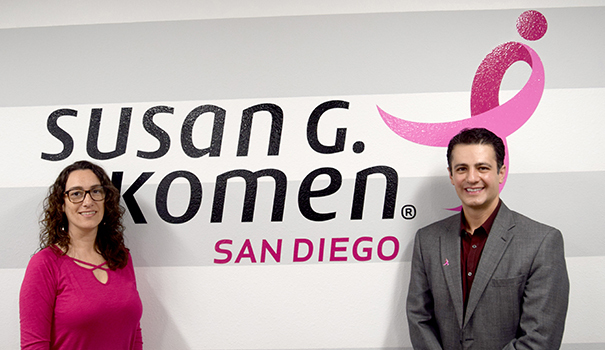 “We have several researchers here in San Diego who are Komen-funded scholars,” Gross said. “For the many years we’ve been doing that research, two of the drugs that Lilian were on were discovered through Komen research. Gross said in terms of the event, it’s going to be a really great evening. “We are showcasing some of the local San Diego science and research that is happening,” Gross said. “During the cocktail hour, we have someone coming and demonstrating how hand-grip strength is related to the strength of your immune system and the likelihood of reoccurrence of breast cancer. We’ll have a microscope so you can see a breast cancer cell and a healthy cell. We’ll have an origami wall made up of notes that survivors have written, so you can kind of get a glimpse into the survivor journey.